WHEN: Saturday, Oct. 1, 11 a.m.
Environmental education in Southeast Germantown will get a boost on Oct. 1, when Hansberry Garden and Nature Center accepts the gift of a Little Free Library from a local Girl Scout troop. Troop 91224, composed of fourth- and fifth-graders hailing from the Germantown, Mount Airy and West Oak Lane neighborhoods of northwest Philadelphia,built the wooden structure, which will be mounted on a post outside the garden’s Hansberry Street gate. HGNC members will donate books on environmental topics to stock the free book exchange. The troop undertook the project in pursuit of a Bronze Award, the first of a series of three community-service awards offered by the Girl Scouts. 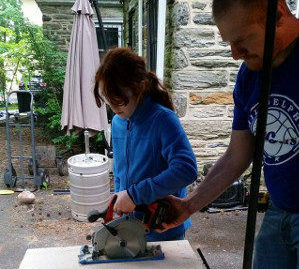 Eleven girls participated, mastering the use of carpentry tools including a circular saw and a nail gun under the supervision of Benjamin Blei, a master carpenter and contractor who is married to troop co-leader Beth Blei. According to co-leader Sheila Allen Avelin, the troop had already completed a Girl Scout Journey – a smaller project calling for an action plan – focused on environmentalism. Their action was to create reusable shopping bags from used t-shirts. A store of the bags is kept at Sheila’s Mount Airy bookstore, Big Blue Marble. Anyone may borrow a bag – a useful service for shoppers at the nearby Weaver’s Way Co-op. The Little Free Library will be dedicated at 11 a.m. on Saturday, Oct. 1, at the end of a community work session at the garden. Members are encouraged to bring environment-themed books to the event.